Few experiences in nature are more rewarding than taking a beautiful hike knowing there is a majestic waterfall waiting for you at the end. Waterfalls are commonly formed when a river is young at the time when the channel is often narrow and deep. When the river courses over resistant bedrock erosion happens slowly while upstream erosion occurs more quickly. As the water increases its velocity at the edge of the waterfall, it picks up material from the riverbed. The erosion capacity is increased when whirlpools created in the turbulence as well as sand and stones carried by the water stream. These whirlpools cause the waterfall the carve deeper into the into the bed and to recede upstream. Many times over a period of time, the waterfall will recede back to form a canyon or gorge downstream as it recedes upstream and will carve deeper into the ridge above it. The rate of retreat for a waterfall can be as high as one and a half meters per year. Waterfalls normally form in a rocky area due to erosion. There is usually a deep area just below waterfalls because of the kinetic energy hitting the bottom. Often, the rock stratum just below the more resistant shelf will be of a softer type, meaning that undercutting due to splashback will occur here to form a shallow cave-like formation known as a rock shelter under and behind the waterfall. Eventually, the outcropping, more resistant cap rock will collapse under pressure to add blocks of rock to the base of the waterfall. These blocks of rock are then broken down into smaller boulders by attrition as they collide with each other, and they also erode the base of the waterfall by abrasion, creating a deep plunge pool or gorge. 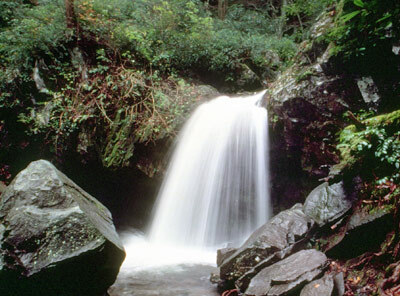 Laurel Falls- This 80 foot high waterfall is one of the most photographed waterfalls in the smokies. Located just a few minutes from downtown Gatlinburg, this trail is paved making it stroller, wheelchair and walker accessible. 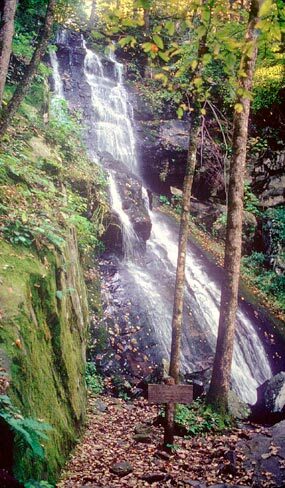 Grotto Falls- Easily walk behind this 25 foot high waterfall just minutes from Gatlinburg off the Roaring Fork Motor Nature Trail. This trail is 3 miles round trip and should take around 2-3 hours to complete. 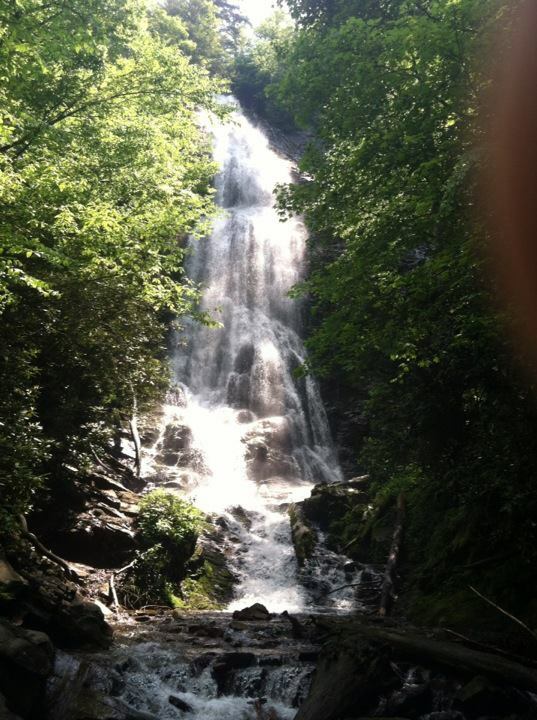 Abrams Falls- This 5 mile roundtrip hike along Abrams Creek is moderate, but worth it. The large amount of water creates a very deep pool, but swimming is not allowed because of the dangerous currents. This hike is in Cades Cove. 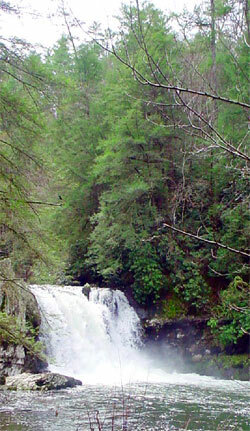 Ramsey Cascades- At 100 feet, this is the highest waterfall in the park. The water collects in a small pool where salamanders can be found. This is a strenuous 8 mile trip will take 5 to 7 hours to complete, but the reward at the end is worth it. To get there drive 5.9 miles from Gatlinburg on 321, then turn right at Greenbrier, at mile 3.2 turn left at the sign for Ramsey Cascades onto the bridge that crosses the Middle Prong and drive 1.5 miles to the parking area. Hen Wallow Falls- At the bottom of the 90 foot high waterfalls you can often find salamanders. During a very cold winter, the falls often freeze to form a beautiful ice formation. At 4.4 miles roundtrip, this hike is moderate in difficulty. Access this hike at the Gabes Mountain Trailhead at the Cosby Picnic area. Mingo Falls- Just outside of the Great Smoky Mountains National Park, you can hike this moderate set of wooden stairs .4 of a mile to this waterfall. The access trail is at the Pigeon Creek Trailhead. From the Oconaluftee Visitor Center, drive south toward Cherokee on US 441 and take the second bridge to the left and drive 4.5 miles to Mingo Falls Campground where the trail begins. 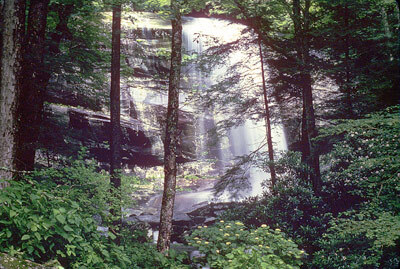 Rainbow Falls- A rainbow is visible on a sunny day when the mist creates a canvas. This 80 foot high waterfalls creates an impressive ice formation in the winter .This hike is 5.4 miles roundtrip and moderate in difficulty. The access trail is at the Rainbow Falls trailhead in the Roaring Fork area. From the Gatlinburg parkway, turn at traffic light #8 and follow the Historic Nature Trail into the Great Smoky Mountains National Park. Continue past Noah “Bud” Ogle cabin to the Rainbow Falls parking area. Meigs Falls- The pull off for this waterfall is along Little River Road 13 miles west of the Sugarlands Visitor Center. This waterfall can be easily missed while driving so be sure to watch carefully for it! Place of 1,000 drips- From the parkway in Gatlinburg, turn at traffic light #8 and follow the Historic Nature trail in the park. Take the Roaring Fork Motor Nature trail and continue to stop #15 at the falls. These waterfalls are breathtaking, but make sure to hike prepared with plenty of water, snacks and hiking essentials in case of emergencies. This entry was posted in ERA In The Smokies, Family, Free Things to Do, Gatlinburg, Great Smoky Mountains National Park, Hiking, Nature, Nature, Things to To, Vacation Planning, Wildlife Adventures and tagged Cabins Gatlinburg TN, cades cove, Family Vacation, Free Things to Do, Gatlinburg, Great Smoky Mountains, Great Smoky Mountains National Park, hiking, outdoor adventure, Road Trip, Roaring Fork Motor Nature Trail, waterfalls. Bookmark the permalink. ← Have you ever seen Smoky Mountain Bull ELK?! The Herbert Holt park located in Gatlinburg, TN offers a handicapped accessible fishing platform.